I have to admit, as a fan of the previous three Ocean’s films (11 and 13, most notably), I didn’t have very high hopes for Ocean’s 8 when it was first announced. It wasn’t because I didn’t think an all-female ensemble could pull off a heist movie of Ocean’s 11 calibre (believe me, they mostly do), but more so the fact that it seemed Hollywood had forgone an original story and just decided to do throw the “Ocean’s” name on what appeared to be another needless genderbending remake. 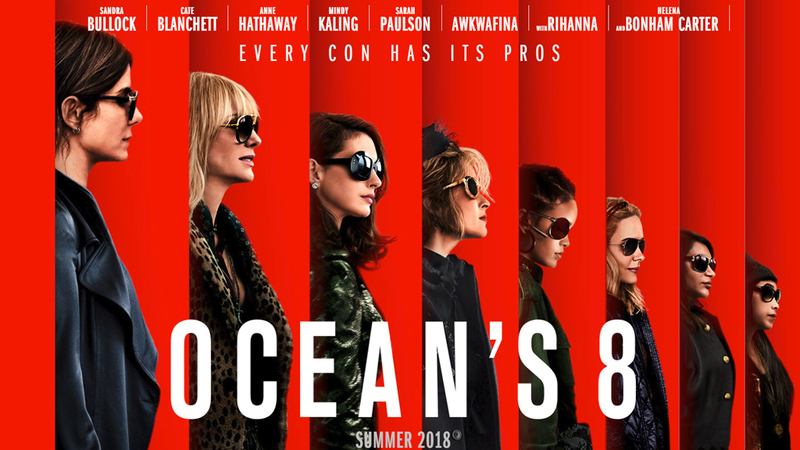 This time, however, I’m relieved to say Ocean’s 8 actually works and fits right in as a soft-reboot to the franchise with direct ties-ins and familiar faces and not to mention, it’s quite a bit of fun as well. Apparently stealing runs in the Ocean family. Sandra Bullock stars as Debbie Ocean, sister to the trilogy’s star con-man Danny Ocean (George Clooney), and she makes a living the same as he did – by plotting heists and running quick cons to get what she needs. After spending five years in prison, Debbie is looking to score big by formulating a crew of eight individuals to steal a rare necklace worth over hundred million dollars from the Met Gala. The film immediately felt like an Ocean’s film beginning with a crafty montage of Debbie, fresh out of jail with $45 to her name, conning her way through a series of small scams and into a luxury suite at what looked to be a very expensive hotel. The scene is accompanied by the familiar soulful music that themed the previous entries and had me thinking to myself already that this movie was doing its job to feel welcomed to the franchise. Debbie’s crew consists of long time partner-in-crime, Lou (Cate Blanchett), a renowned fashion designer (Helena Bonham Carter), a hacker (Rihanna), a fence (Sarah Paulson), a jeweler (Mindy Kaling), and a street hustler with a wicked sleight of hand (Awkwafina). Now, if you’re like me, you’re probably wondering where the eighth person is considering the title, but that comes as a surprise later on. Although some of their character depths are quite bare, I think these seven ladies do quite a wonderful job bouncing off of one another and I could sense a chemistry amongst them that may expand in future installments. The mark is the A-list fictional celebrity, Daphne Kluger (Anne Hathaway), who’s expected to attend the Met Gala and unknowingly coerced into wearing the coveted French necklace. Hathaway is at the top of her game and the standout of this film. Her performance quickly reminded me of why I love her in almost anything and why she’s so entertaining to watch. Narratively, the story can be a bit confusing at times. Friend and fellow critic, Jason Wiese, and I agreed during the film’s credits that at times it wasn’t clear what was exactly going on until the actual heist was underway, but that may have been intentional considering the type of movie and the twists and turns that were surely to come. The humor was present but sadly some of the punchlines missed their mark. Writer/Director Gary Ross (Big, Seabiscuit, The Hunger Games) is fantastic behind the camera utilizing slick transitions and truly making this film feel as close to the films Steven Soderbergh created in the early 2000s. In the end, I was pleasantly surprised with Ocean’s 8. If you’re fan of the previous films, you’ll find neither your time nor money wasted here. Though I think there were some opportunities missed and some of the technology was maybe a little too far-fetched, it’s still an enjoyable ride and I wouldn’t be surprised if we see more of these ladies in future installments. In fact, I’d welcome them. Ocean’s 8 gets a B.